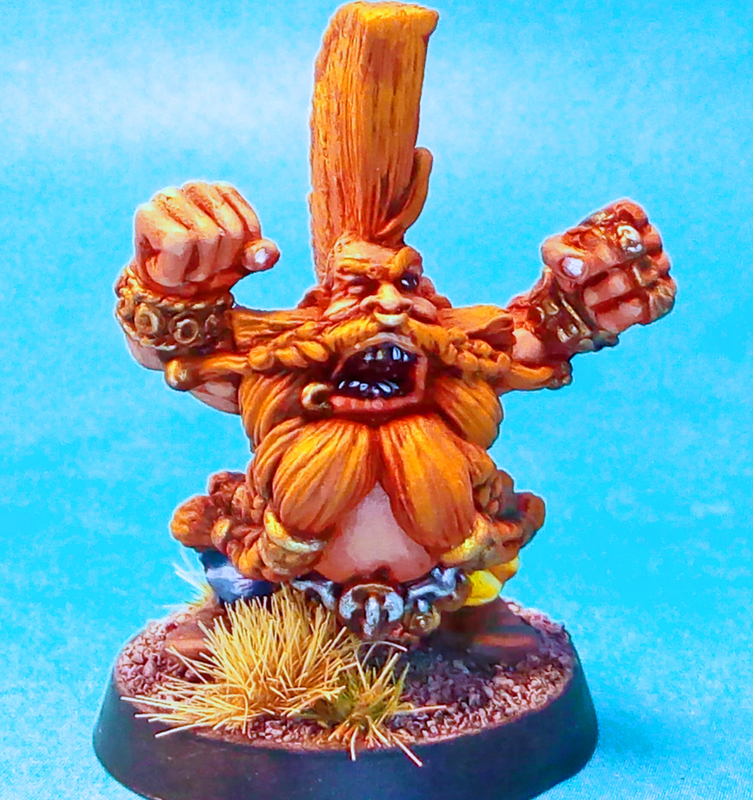 So I've got one final Bloodbowl model to show off. What would a Dwarf team be with out a Death Roller? Not a fun team, that's what! So of course, I had to get a Death Roller. The second iteration has always been my favorite, even though it lacks the classic look of the original and the dynamism of the most recent incarnation. 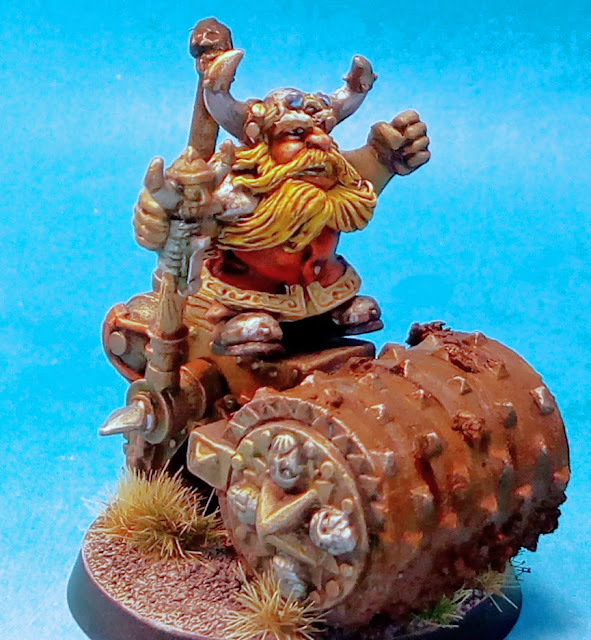 But it was the first Death Roller I was exposed to, and as Dwarfs are my first love (Warhammerly speaking), I fondly remember oohing and ahhing over it in the pages of White Dwarf...somewhere around the 180 range. This model was a ton of fun to paint. 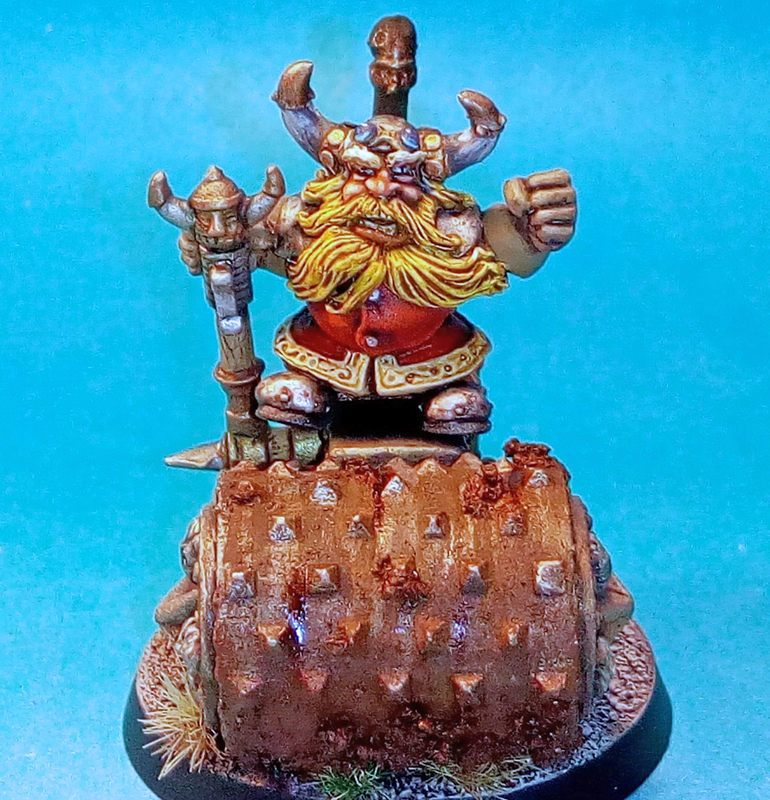 The driver was painted the same as the rest of the Dwarfs on the team. 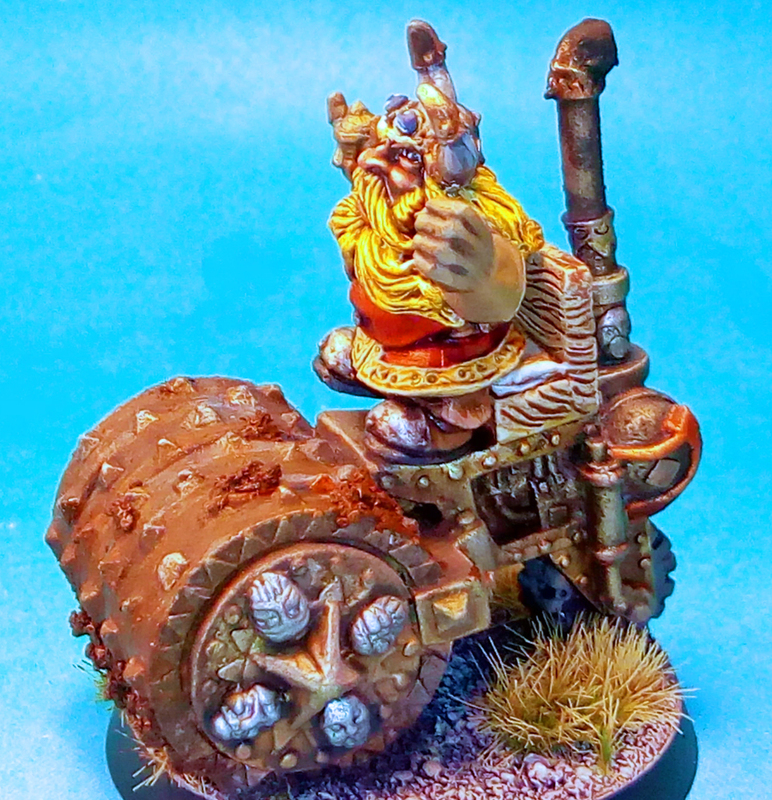 For the Death Roller itself, I left it metallic, mostly brass. I started with a base of Hashut Copper, washed with Army Painter Strong Tone Ink, and then highlighted with Runelord Brass, Sycorax Bronze, and then Stormhost Silver. I applied some green washes to simulate weathering, but that muted the colors too much, making it look like dirty steel. So I applied a few glazes of chestnut ink to bring back out the reds. The Steels were painted with Ironbreaker highlighted with Stormhost Silver and washed with thinned Typhus Corrosion. The copper lines were the old hex pot copper (no idea what the name was) and highlighted, but I forget how. 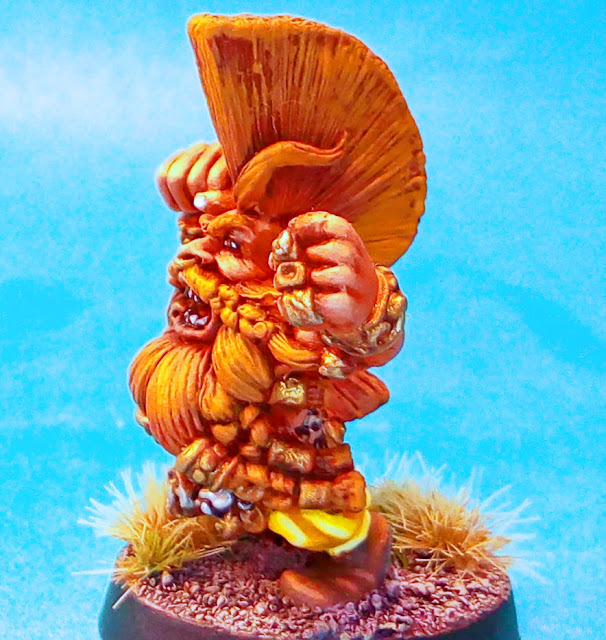 The Dwarf icons were Stormhost Silver washed with P3 armor wash. The weathering on the roller was done by painting streaks Ammo of Mig Streaking Grime and Light Rush Wash, Dark Earth pigments mixed with enamel thinner, Typhus Corrosion. After this was dry, I feathered out the enamel streaks. Then I lightly drybrushed the spikes with Stormhost Silver. After that I applied streaks of tamiya clear red, to simulate blood, and put some clumps of mud in random places on the roller. I ended up overdoing it a little because I didn't apply each of the enamel based products separately with varnish in-between. What ended up happening is some of the effects got too blended together, leading to the rust look being too widespread across the roller and somewhat drowning out the dirt and the grime. As I've previously mentioned, I began working on a "modern" chaos army way back in 7th ed. Warhammer. At that time in my life, I was still struggling with the balance between playing Warhammer for fun and playing Warhammer to win and I still cared about army lists. So when I saw that the mark of Nurgle granted a +1 to hit and a -1 to be hit, I had to have a unit. It only took me eight or so years to finish the ten of them! 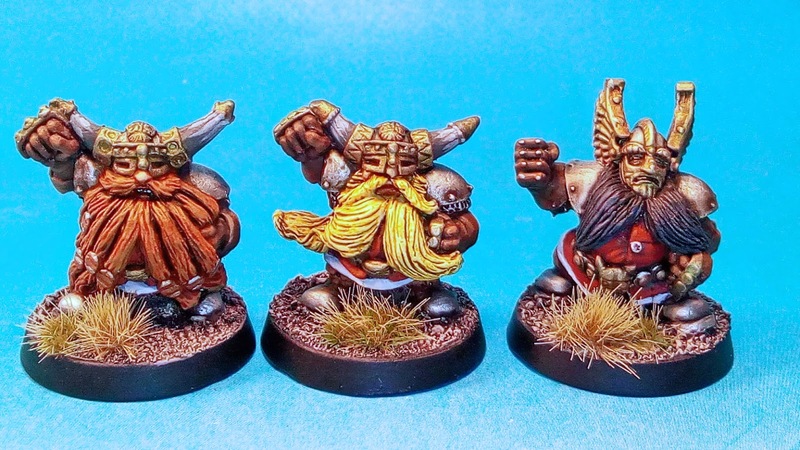 The final three warriors were painted pretty similar to the other seven. The armor was painted based with Knarloc Green (or whatever the current version is called). I then shaded this by mixing in Necron Abyss. After the shade, I highlighted by mixing in bleached bone. I tried to mix up the leathers amongst all ten of the unit, but these three were done largely the same for speed purposes. The belts were Vallejo English Uniform Brown highlighted up with Vallejo Buff. The gloves and boots were a mix of scorched brown and bestial brown highlighted up by mixing in deathclaw brown. The nice thing about painting Nurgle stuff is that metallics are a lot easier. The steel was painted chainmail and washed with Ammo by Mig streaking grime and light rush wash. Then stippled with various red browns and oranges to simulate rust. Rust spots were also applied to the armor in the same manner. The brass was painted Vallejo Brassy Brass, washed with Devlan Mud and then oxidized with Nihlakh Oxide. 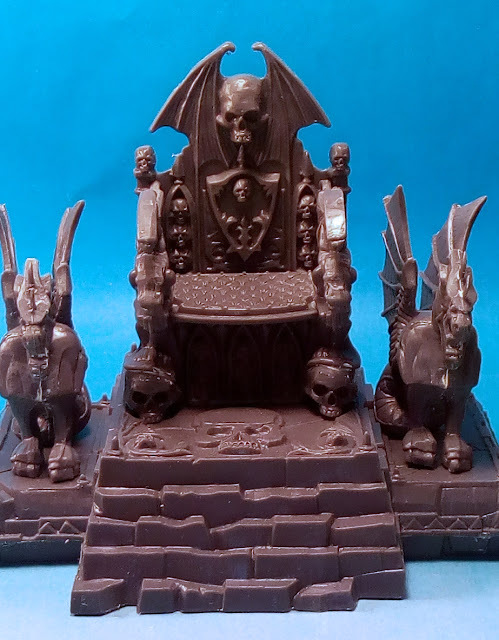 So back in my original blog post on my Bloodbowl team, I mentioned that I had a few previously, and very poorly, models that were to be stripped and repainted. Well, they're done! As an initial matter, these pictures were taken with my terrible cell phone camera (and heavily corrected in photoshop) so they may be a bit pixelly. First up are the two remaining Longbeards and the single remaining Blitzer. Each of these was a duplicate model of one I'd already painted. I made sure to paint their beards differently and I mixed up the gloves as well. Other than that, pretty standard. 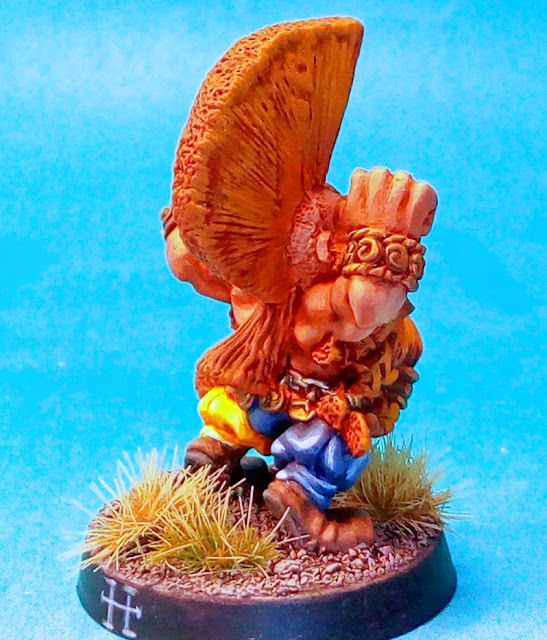 The other model I had to repaint was the Bloodbowl Star Player Grim Ironjaw. I don't really feel that the pictures do him justice as I think he's one of the better models I've ever done. The blend on his belly is way smoother in person, I promise! Because Ironjaw is a star player, I didn't want to paint his trousers in the same read and white color scheme as the rest of the team; I figured he's mercenary and wears what he wants. However, I also wanted to stick with my original theme so I chose yellow and blue for the colors as these are the colors of the most common away kit of Arsenal Football Club. I also made sure the make the yellow and blue quite bright. 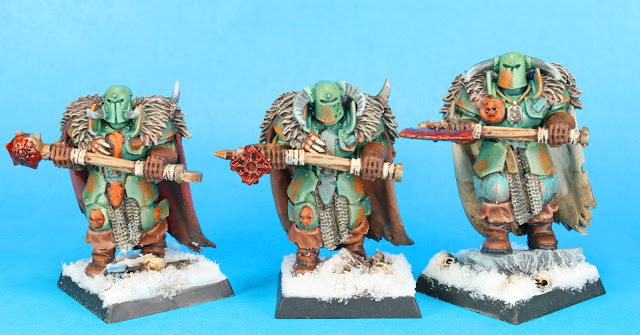 I kind of view slayers as the "Guidos" of the Warhammer world--very flashy and ostentatious. As a result, no muted earth tones for him! Finally, I went back and painted identifiers on all the Bloodbowl models. You can see the rune in the last picture for Grim Ironjaw. I didn't want to use imperial numbers for the Dwarfs and the dwarfen numeral system is pretty much just tick marks, so I instead opted to use the Dwarf alphabet. He probably didn't need one, but the rest of the team did, so I can identify who has what skills and so on. So I've seen a lot of other bloggers doing an end of the year review for 2016 and I wanted to get in on that action. However, I wanted to do something a bit different. 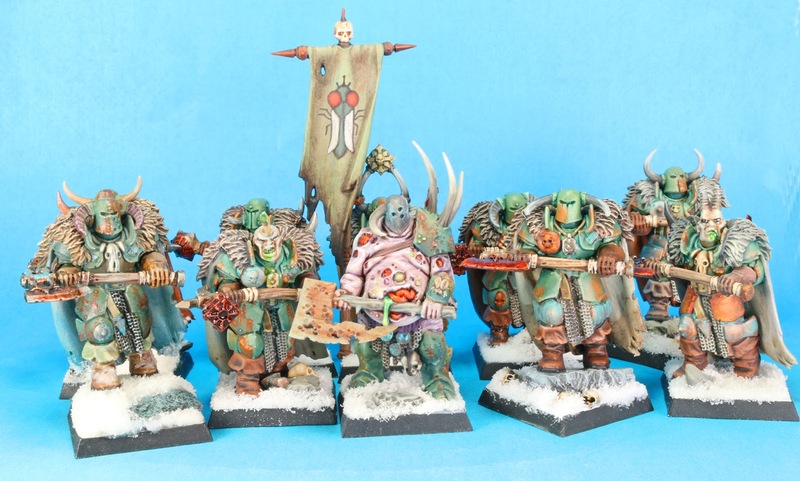 Where a lot of other bloggers have shown everything they painted or focused on stuff that was painted but did not feature on their blog, I wanted to showcase the stuff I started but didn't finish, since virtually everything I painted in 2016 has been shown off here (or it will be over the course of my next few blog posts!). First up, is a Chaos Lord for my modern-hammer chaos army. 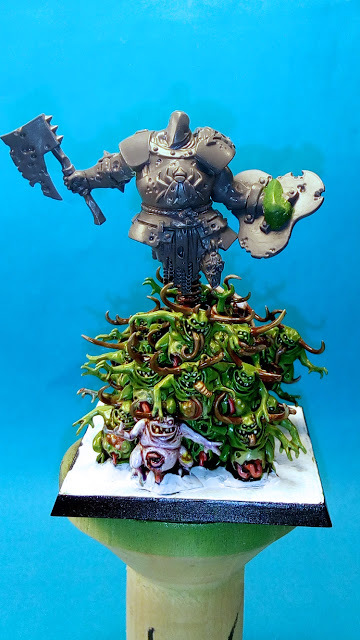 I've named this chap the Lord of Worms and he's born aloft by a horde of Nurglings. As you can see, the Nurglings are pretty much done and the bulk of the lord is converted. He needs some more work though, as I have a lot planned for him. The fact that this model isn't finished yet makes me sad. 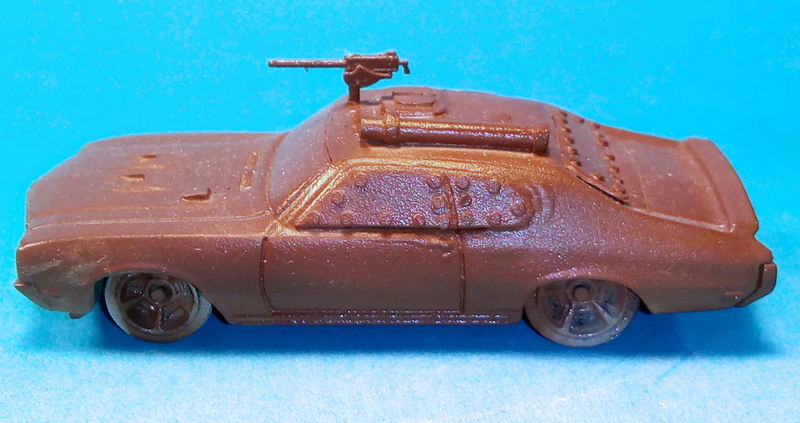 I converted it as a test model for Dark Future about two or three years ago. This year, I put the base coat down. Next I have to apply chipping medium and then the paint. Part of the problem is I can't decide what color I want the top coat to be! 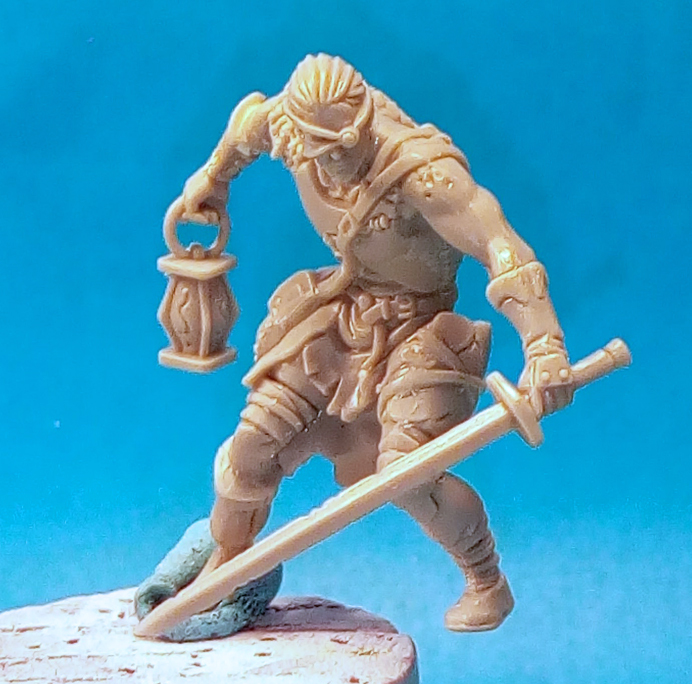 Although this is a GW kit, it's intended for use in Frostgrave. The throne and platform are finished and I've done the gap filling on the two gargoyles on the side, but haven't sanded them flat yet. Once that is done, it's ready for paint! So with the Kingdom Death Kickstarter this year, it reminded me that I still haven't touched my stuff from the original Kingdom Death Kickstarter! So I decided to start working on the Adam model that with my pledge. At this point he's mostly built. I've got a slight gap on one of the wrists to finish and I need to prep his spear and shield and he'll be ready for paint as well. 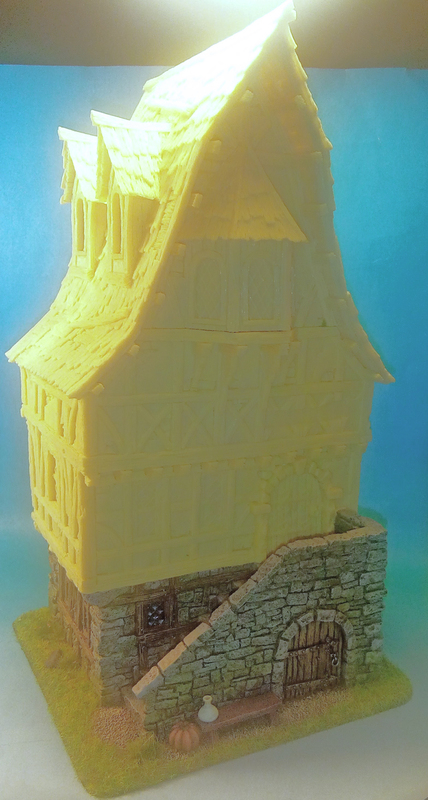 And finally (and I apologize for the lighting, resin is hard to photograph with my crappy phone), a townhouse from Table Top World. As you can see, the bottom level is complete. I want to add some stucco textures to the upper levels and I have to figure out how best to attach the porch piece so that I can use the inside of the building. So there you go, hopefully I'll finish these projects in 2017!